Climate change gets all the press. Biodiversity loss is a greater threat. Caring for the natural world that supports us is one of the most important issues to me, political or otherwise, and it’s such a common-sense idea that I think very few people actually disagree with it. “We should destroy nature,” is simply not a sentiment that most people have. So then why is there such a political shouting match over environmentalism? I scarcely scroll by one article on my Facebook feed reading, “What, you don’t believe in FACTS?” before another article pops up about brainwashed alarmists jumping to fanciful conclusions. What gives? Caring for nature isn’t liberal or conservative. It’s just the right thing to do. But even many who profess to care about nature seem like they’re just trying to score points in an argument when they talk about climate change. If climate change were solved tomorrow, would the environment be saved? We’d still be dumping eight million tons of trash into our oceans every year. We’d still be rapidly destroying our planet’s topsoil, 40% of which is already degraded from too much farming. We’d still be burning through old-growth forests to make way for suburbs and crop fields. And we’d still have killed half of Earth’s wildlife, and be well on our way to wiping out the other half. That’s right: half of the vertebrates on Earth have died in the last fifty years. There are now 50% fewer non-human vertebrates on Earth than there were a half century ago. That’s not to say half of all vertebrates have gone extinct. Only about seven percent of modern species have gone extinct so far, never to be seen again. Which is a lot of species. One species going extinct, even locally, can screw up a whole ecosystem. After wolves were hunted to death in Yellowstone Park, for instance, the elk they used to eat went through a sudden population boom. The trees and plants the elk ate were then decimated by the massive number of elk, starving many other species that relied on that vegetation. 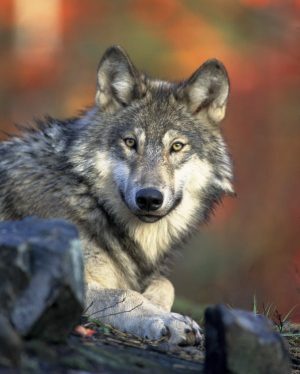 Only after wolves were reintroduced in the 1990s was the park’s ecosystem restored to its traditional balance. Much of nature exists in this kind of fragile balance, especially at the local level. Even within a single species, large numbers of individuals dying off will deplete the population’s gene pool, eventually leading to inbreeding and reduced fitness of the whole group, possibly followed by extinction. For comparison, imagine that you and your extended family were the only humans left alive on Earth, and you should get a picture of the reality that many animal groups alive today are facing. The number of species that exist in an area and the genetic variety within each species make up what ecologists call biodiversity. It’s the most important measure of the health of both species and ecosystems. In order for life to thrive, reproduce, and live in balance with the rest of nature, high biodiversity is absolutely essential. Humans aren’t making it easy. We’re part of Earth’s ecosystems, after all, and our prosperity at the top of the food chain has had the same effect as those Yellowstone elk’s prosperity: we’ve unbalanced everything beneath our level. Again, half of all vertebrates on Earth have been killed in just fifty years due to human activity. The level of destruction is so severe that biologists believe we’re living in the middle of a mass extinction event—and that event is us. The activities causing the extinctions are the usual suspects: too much agriculture, too much urban development, a plethora of invasive species transported by us, and obscene levels of pollution. (Notice how low climate change is on the list of usual suspects linked above.) These activities wreak havoc on local ecosystems, but humanity’s impact is so far-reaching that there’s even some worry that all of our local impacts could snowball into planetary-level catastrophe. Do all the small ecosystems add up to one big ecosystem? If we pluck enough blocks out of nature’s Jenga game, will the whole tower fall? We don’t know for sure, but in 2009 researcher Johan Rockström of Stockholm University tried to find out. 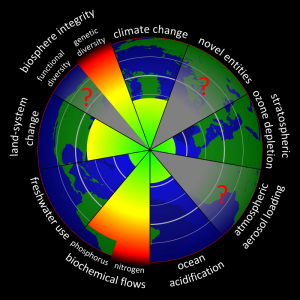 He and his team collaborated with experts from numerous scientific fields to create the Planetary Boundaries: a highly regarded list that quantifies seven of our planet’s environmental limits. Not only does it detail what the limits are—it also tells us how much further we have to go until we cross each limit. When a limit gets crossed, we risk passing a planetary tipping point, changing nature permanently, and on a large scale. We’ve already crossed three of the boundaries. And the most egregious offender? But while the press gobbles up any news about climate change due to the issue’s political tint, it virtually ignores ecologists’ urgent pleas about the extreme jeopardy of Earth’s biodiversity. With the globe uniting to solve climate change, our trajectory points toward an eventual solution to it, Trump or no Trump. Even in the absolute worst case scenario, there are indications we’d be able to innovate our way out of climate change. We won’t be able to do so for biodiversity loss. 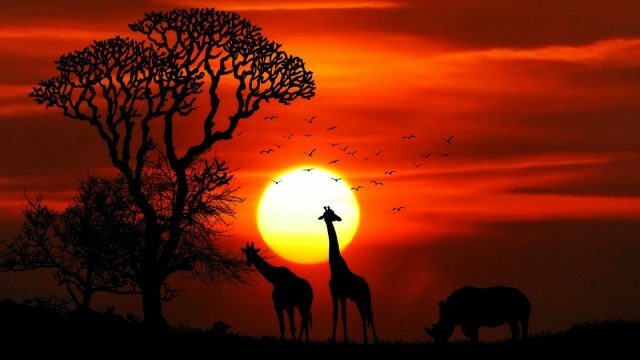 Once a species goes extinct, it’s gone forever. Don’t get me wrong. Climate change is a very serious problem. 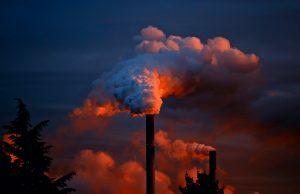 Most of the world’s people, the vast majority of its governments, a near-total consensus of its scientists, and even most of its corporations by this point, all agree that climate change is human-caused and an urgent threat that we need to deal with. Literal tons of research have been done on the topic, and the research makes a compelling case. Biodiversity loss and climate change are obviously linked, with each contributing to the other. There’s also ample evidence that oil companies have tried to manufacture doubt surrounding climate change. And there’s essentially no evidence that there’s any type of global conspiracy to use climate change to increase government control over people. Science does not work that way. Climate change is just a problem so big that only big governments or big corporations will be able to solve it, and since corporations won’t do it, it’s governments’ responsibility. But we on the left don’t like to admit how much blame we actually do carry for politicizing climate change. “We’re just reacting to the right’s denial,” you might say… but there are a lot of different ways we could react. Why have we chosen the most acerbic, political, mean-spirited response? A lot of us would even be hard-pressed to explain the mechanisms behind climate change, the specific impacts it will have on our environment, or how we know that it’s real and human-caused. If we’re honest with ourselves, I think most of us believe it’s a problem just because the tribal group we belong to believes it’s a problem. We should acknowledge that climate change is only one of the myriad ways humans are destroying our global ecosystem. 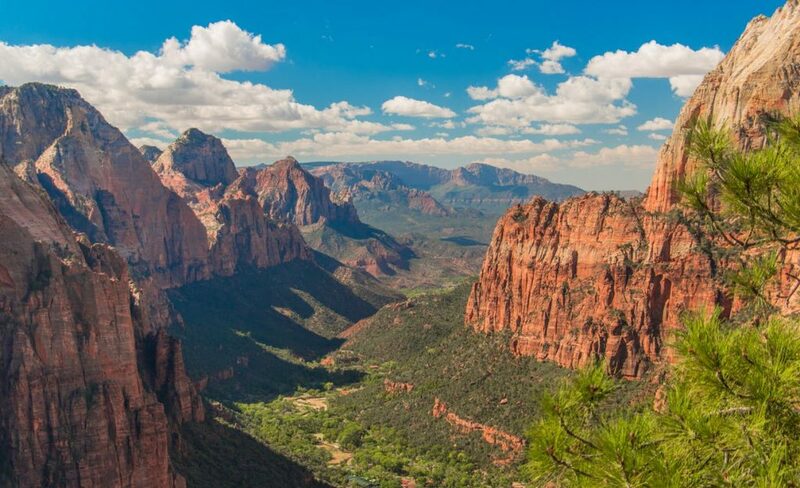 Other areas of conservation are just as urgent as climate change, if not more so, and they haven’t had a controversy manufactured around them by corporate lobbyists. Why not use these cold-button issues devoid of political baggage to try and convince people that environmental issues are urgent? If we call people’s attention to stopping biodiversity loss—saving animals!—I think we’ll get a lot more traction. It may also be worth pointing out that conservation is inherently conservative. Republicans have a long history of protecting the environment, from Teddy Roosevelt’s founding of the National Park Service to Nixon’s creation of the EPA. The Bible itself calls on humans to be faithful stewards of the Earth. Only within the last fifty years or so (since oil companies began paying conservative politicians), has environmentalism been viewed as a “left-wing” issue. In fact, I myself used to think environmentalism was stupid. Those crazy hippies would really stop construction of a dam that could power thousands of homes just because an endangered beetle or something lives in that area? I thought. It seemed ridiculous to me that nature-worshippers could care so much about trees when the world has so many other pressing problems to deal with. But when I dug into the matter and learned how fragile natural ecosystems actually are—and how many of them have already collapsed—it became apparent to me that environmentalism makes sense, if from no other perspective, then at least from a position of self-interest. Many of the natural resources we depend on are at risk of permanent depletion within my generation’s lifetime. I’m not someone who hugs trees because I think trees are more important than people. I’m just concerned about nature because I want my grandkids to have, you know, food. Use government mechanisms or market mechanisms to protect nature, I don’t care. But environmentalism itself shouldn’t be a political issue. And climate change shouldn’t get all the press just because a controversy has been manufactured around it. I think the environmental movement would get a lot farther by emphasizing everyone’s common interest in preserving our planet’s life for the future. Biodiversity loss is as great of a threat as climate change, and it’s time we start publicizing it—and doing so in a nonpolitical way. … Of course, I could easily be wrong about everything written in this article. I’m an environmental enthusiast, not a scientist, so although I’ve researched my case and made it as best I could, please take all this with a grain of salt. On scientific matters, I defer to the experts—not to political pundits. 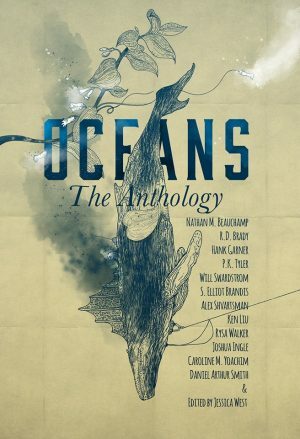 A bunch of sci-fi and fantasy writers, myself among them, just released a new anthology called OCEANS , and several of the stories in it deal with environmental themes. My contribution details the life story of a renowned oceanographer, told backward from the brink of her death in the 2070s to her childhood in the 1990s, as she probes the memories from her life full of hardship and failure for an answer to the question: Was it all worth it?